With the global trend in designing interactive websites, Flash design has become an integral part of Websites. Simplest forms combine static/dynamic colorful graphics, some interactivity, audio and information of course. More advanced (common these days) would include graphics, dynamic text, animation, clips, movies based on Macromedia Flash, Dream-weaver, Fireworks, and higher level of Interactivity, streaming audio. Flash based websites are more appealing in terms of their presentation. For they have a graphical inter phase that gives the visitor on the website more defined look of an organization and there services offered. With Flash based websites you may be able to tell things that you aren't able to in static websites. The possibilities of web graphics are infinite in terms of imagination - animation and sound that may touch the senses of a visitor on the website leaving a long lasting impression and high impact. It has the power to raise an emotion or excitement. It's amazing what one can do with such graphical tools. The visitor on the website is not just given the information but they are provided with some outstanding skill. 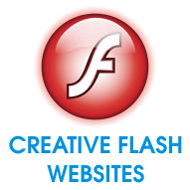 We provide a low cost flash Website designing, flash intros and corporate flash presentations. Our designer have offering Flash based websites with superb animation effects over the years of experience in animation development in flash. We are proud to offer you high quality flash presentations and animations with astonishing sound effects, customized backgrounds and props to support the animated scenes.